That I am your enemy. Ever seen “Mine“? A film about an American marine who accidentally steps on a land mine in the Afghan desert and an entire film he must remain motionless in the same place, until help arrives. “The Wall” shows an almost similar situation. 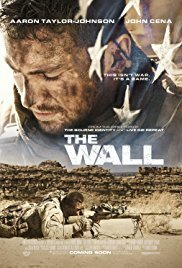 Only this time it takes place in Iraq and the American soldier Isaac (Aaron Taylor-Johnson) sits behind the remains of a primitive wall. The only thing you’ll see in this film, is a psychological game between the professional sniper (who we’ll never get to see) and this soldier. Through a captured transmitter, he can communicate with Isaac and at the same time deceive other military personnel. In the crosshairs of an Iraqi sniper. It’s never really exciting. The only thing Isaac is working on, is finding a way out and ensuring that his partner Matthews (John Cena) won’t be slaughtered mercilessly by the most appropriately entrenched sniper. And this can only be prevented by talking sincere about himself. So the only thing we see a whole hour, is a distraught Isaac who has no water or transmitter at the beginning (And he has a terribly bleeding gunshot wound) talking to the Iraqi sniper, who apparently damn well knows how the American military apparatus works. A politically charged conversation unfolds between the two gentlemen. Discussing war, terrorism and Islam. A Shakespearian word game in which the Iraqi intellectual sounding gunner tries to justify his actions. A psychological game that drives Isaac to despair. A limited film that fascinates. Despite the fact that the film is limited in all possible ways (one character, one location, no special effects), the film remained extremely fascinating. Only I thought that the behavior of the two soldiers was implausible at a certain moment. I assume those were two trained, experienced soldiers who already had done a number of tours. But when you see the first one wandering towards the oilfield in a casual, worryfree way, it really looks amateurish. And then the way his partner starts running to help him. I guess it’s panic that is to blame and an explanation for his behavior. But besides this sigh-moment, I thought the acting wasn’t so bad. And some will experience the denouement as abrupt and disappointing. I, on the other hand, do like such uncommon endings. It doesn’t need to be a happy ending all the time!